The NFL calendar is officially over yet here we are again… talking about football. To finally put this season to rest, I thought I’d generate some discussion on the good and bad that was this football season, the pleasant surprises and the outright busts. And don’t think I’ve forgotten we have an all new winner for our annual over/under contest. We saw some bright new faces this NFL season. For once, it wasn’t the same old retreads. Sure, the Patriots, Steelers and Saints all made their usual post-season pushes as did the last two runners-up, Atlanta Falcons and Carolina Panthers but we also saw the Jaguars make an unexpected splash. The Rams didn’t fare too poorly either. Most of us had them nowhere close. While it was nice to see the kings of the hill keep pace still, it’s also nice to know that the future of the NFL is in good hands. Oh, and let us not forget the Eagles. We’ll get to them in just a bit. Individually, we saw veteran quarterbacks like Tom Brady, Drew Brees, Philip Rivers and Ben Roethlisberger all surpass 4200 passing yards but the new breeds, Carson Wentz and Jared Goff also held their own. I guess choosing those guys one-two in the draft wasn’t such a bad idea after all. We also saw promising new talent in the backfield. Kansas City rookie Kareem Hunt led the league in rushing while Todd Gurley bounced back from his sophomore slump for an MVP-caliber season. Jacksonville rookie Leonard Fournette helped lead his team to the AFC Championship game. The Saints’ Alvin Kamara won offensive rookie of the year and while you may think I only talk about offense, Kamara’s rookie teammate Marshon Lattimore won defensive rookie of the year for his stellar play in the secondary. Speaking of accentuating the positive, how about those playoffs? Eight of the eleven post-season games, including the Super Bowl, were decided by eight points or less with the bulk of them coming down to the very last play. If that’s not parity, then I don’t know what is. It was most certainly quality entertainment. Not to be outdone, the loaded Philadelphia Eagles finally won a Super Bowl thanks to a healthy handful of great players, flawless execution down the stretch and a head coach with a brass set. 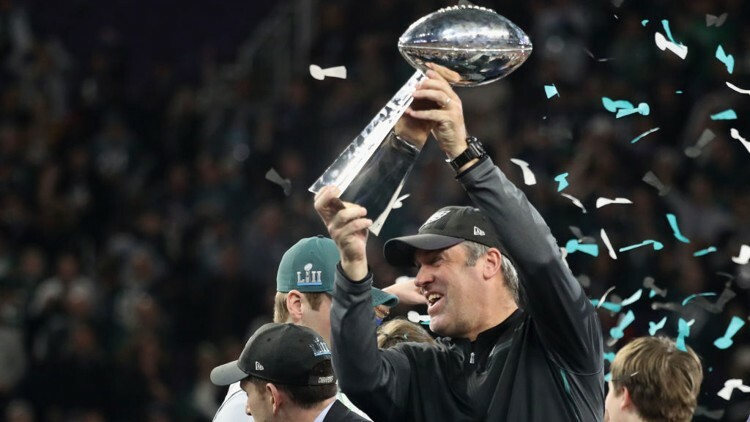 By most accounts, Doug Pederson out-game-planned what many consider to be the greatest head coach in the game in the biggest game of the year. While going for it on fourth and short from your own territory and running a trick play on another (and converting both!) 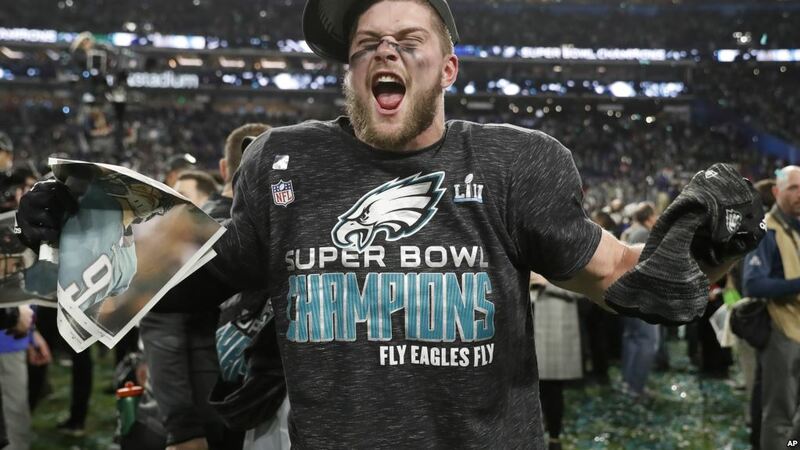 might have seemed like a no-brainer to some, let me tell you, if his team doesn’t execute those calls (which they did to perfection), there’d be a lot of second-guessing in the City of Brotherly Celebration. Fortunately for Philly, it never came to that. Pederson might not have a statue built right next to Rocky Balboa but he’ll never pay for another drink in that town again. And speaking of celebration, the NFL finally re-allowed its players to celebrate touchdowns in the end zone. What we saw, instead of flags for poor sportsmanship was a bunch of players being silly and using their imaginations. Boys being boys, not taunting, but actually showing the emotion that we expect them to show after a job well done. Sometimes corny, often off the cuff, the league did good to finally allow its players to express themselves in a manner we could all enjoy. Of course, while there’s good, there is also bad. We saw a ton of injuries end the seasons of players we love to watch. It’s a physical sport and that’s going to happen no matter how hard the league tries to prevent it. Pittsburgh Steelers phenom Antonio Brown lost time to an injury we all thought might be worse. Philadelphia lost Carson Wentz for the season. Fortunately for Philly, they had a more than capable back-up to see things through #SuperBowlMVP. Pittsburgh Steeler fan favorite Ryan Shazier underwent spinal stabilization surgery after being carted off the field in early December. He is only now starting to walk again. Green Bay fan favorite Aaron Rodgers was lost to a broken collar bone and the Cardinals do-all David Johnson went down the first week of the season, costing Arizona, and almost every player that drafted him first in their fantasy league, a shot at the playoffs. Then there’s the reception… or lack thereof. The NFL has yet to clearly decide what defines a catch. The phrase “surviving the ground” entered every football fan’s vernacular meaning the ball may (or may not) touch the ground in determining a touchdown. Still confused? So is the NFL. The league’s indecision came into play down the stretch with a Jesse James catch that wasn’t and a Zach Ertz catch that was and would have resulted in rioting in Philadelphia if the NFL went the James route. Rest assured league officials will do their best in the off-season to classify what constitutes a catch… again. We can only hope that means we’ll see results. Concussion protocol remains a huge issue with teams breaking the rules the league established. The NFL will always struggle with its inherent violence. When a player gets snowplowed in the helmet by another player’s helmet, there is only so much the league can do to protect its assets. After an injury, teams pull their players into a blue tent on the sidelines with team physicians reporting what happened as they see fit. Those watching are left to guess what the hell is going on underneath that tarp. I don’t think we’re on an immediate need to know basis but some makeshift blue tent can’t be the answer either. The Cleveland Browns once again remain the league’s laughing stock. One win in their last two seasons? How long can this go on? 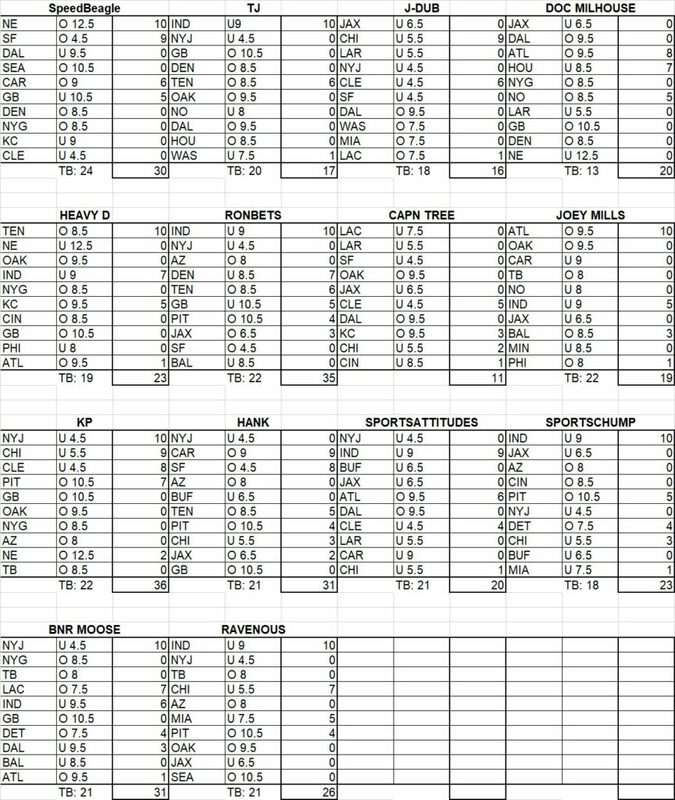 In a league that does its best to promote parity, the unhealthy number of bad teams can’t be good for ratings. There were about ten teams this season that were borderline unwatchable. We saw an inordinate lack of upsets with favorites covering an abnormal amount of times, spelling doom for those such as yours truly who tend to bet the underdogs. The NBA suffers from its top-heaviness. While we did see a lot of the same old teams at the top again, familiarity breeds contempt. Philadelphia winning the Super Bowl was win-win for both the city and the league. And then there’s that whole kneeling thing. We’re not going to get into this any more than we already have but rest assured, this is another issue that will be addressed in the off-season. And now to our contest results. Boy, were WE off-base! I’d like to congratulate fellow blogger whose wife hates sports, Kevin Paul for landing 36 points. It wasn’t great but he beat the rest of us. Your t-shirt if on the way, good sir. Wear it in good health. This entry was posted in Uncategorized and tagged Aaron Rodgers, Carson Wentz, Doug Pederson, Jared Goff, Kareem Hunt, Leonard Fournette, NFL, NFL Futures Contest, Philadelphia Eagles, Super Bowl, Todd Gurley, Tom Brady by Chris Humpherys. Bookmark the permalink. Keep it coming SC. For a know nothing, I almost snagged another shirt. Idea for your next writing…is south FL really pissed at Jeter’s work or is this a LeBatard made up drama in regards to the Marlins yard sale? You’re right about that, Moose. Not a day goes by that DLB doesn’t pick a fight with Jeter about the way he’s running thate team. While he may have been responsible for moving Stanton, I’m pretty sure Jeets had nothing to do with fleecing the good people of Miami to build that stadium. The Super Bowl indicated that the league is coming down on the side of common sense in the case of what constitutes a touchdown reception. Better late than never I guess. Cheers! I’ll believe it when I see it. Consistently. My take on the Olympics will be up shortly.